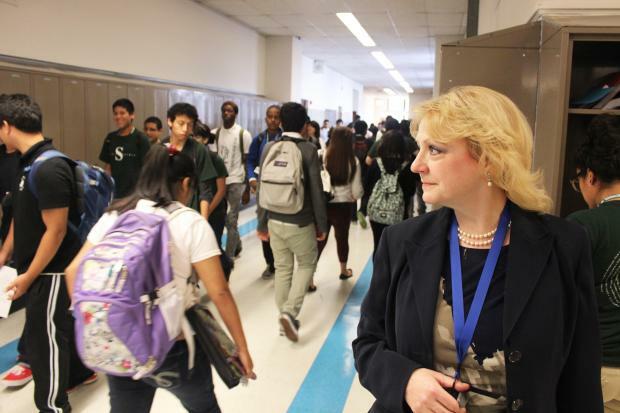 Susan Lofton, former principal at Senn High School, resigned this week. EDGEWATER—Popular Far North Side Principal Susan Lofton resigned from her post at Senn High School in Edgewater Tuesday after being removed from the school Friday. Lofton's resignation was confirmed by Ald. Harry Osterman's office as well as Bill McCaffrey, a Chicago Public Schools spokesman. Lofton, who has been with CPS since March of 1992, was removed from her post Friday after an investigation by CPS' Inspector General, officials said. A Senn employee not authorized to speak with the media said Carey had the "full support of every single in the building," as well as the support of the network. The employee also said while it's understandable Lofton's removal from the school is certainly a stain on the institution's brightening reputation, they don't want scandal and controversy to overshadow the school's many accomplishments. "It was one person, I understand it was the principal, but we're not going to like all of a sudden forget everything we've done in the last six years," the employee said. "We're not going backward, we still want to go forward and we're just going to have to muddle through this to figure out how we can do that. A school's not one person, it's a community." McCaffrey said the investigation by the the Inspector General's office had been completed by Friday, and based on their findings Lofton was removed. After her removal, she was put on paid leave while the charges against her were currently being reviewed by the district's CEO and general counsel pending a pre-suspension hearing — at which point an official assigned to the case would have determined if the reason for her dismissal was legitimate or not, CPS officials said. At the end of the year, the Inspector General's office will release an annual report, though McCaffrey could not specify how many details of Lofton's investigation would be included. Senn's Local School Council had to wait to offer a contract to a new principal until Lofton's employment with the district became final one way or the other, CPS officials said Monday. The Senn employee said Salemi made clear during that meeting the local school council would be responsible for selecting Lofton's permanent replacement at the well-known Edgewater high school. "She was able to turn us around very quickly and get us to where we are, so having that in place is still a huge positive thing for the neighborhood, and I want the neighborhood to understand that," the worker said. "This is is a school that is going to continue its success even though its leader may be gone, we're going to go on."